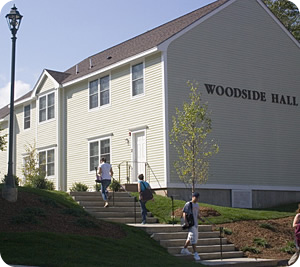 Woodside is centrally located on campus and is a good choice for a group of friends in which each person prefers their own bedroom. There are 6 air-conditioned units, each with 5 single bedrooms for a total of 5 occupants per unit. Each unit has a multi-level design and contains a kitchen, dining area and living room. There are 2 bathrooms on the second level and one on the first. The kitchen has a full-sized refrigerator, oven, microwave, sink, cabinets and counter space. No utensils are included. Each unit has its own entrance.